Business owners can employ a number of methods to “green up” their indoor environments to make the interior more comfortable and to lower heating and cooling costs. One method is installing window film. Window film is represented in three general categories. Most familiar to consumers is the tinted cellophane-type material that can be applied temporarily or used as needed, as in glare-reducing retractable shades. It can also be semi-permanent, such as window tint that is applied directly to windows and remains in place. It can also be permanent, such as the product Heat Mirror™, which is different from typical films and tints. Their prices range from fairly inexpensive to very expensive. CCPIA inspectors can learn more about the different types of window film technology available, along with their performance characteristics, which can be useful when it comes time to make recommendations to their clients following an energy audit. Window film or tint is available for purchase from hardware stores in long sheet rolls. It’s relatively inexpensive and may be applied directly onto windows by the business owner to provide shading without blocking all sunlight. 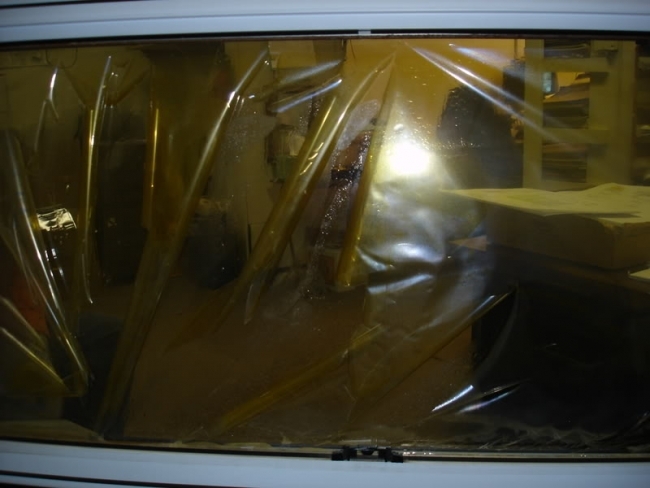 This is the same type of tint found on vehicle windows. Heavy-gauge window film is sometimes applied to windows to keep them from shattering into dangerous shards in case of an impact. Most window films can be cut to fit any size or shape and can be removed with steam or a razor blade and alcohol. Heat Mirror™ and low-E coatings are factory-installed and permanent. Heat Mirror™ is a clear, three-layer polyester film that transmits light through insulated glass units (IGUs) while reflecting long-wave infrared energy. It was developed by Southwall Technologies in 1980 to reduce the amount of solar heat transferred into a commercial building, increasing the occupants’ comfort and reducing energy costs. Heat Mirror™ can be mounted inside an insulated glass unit in a variety of configurations (one, two or three coated films, uncoated, or low-E coated glass) to provide energy conservation performance ranging from R-6 to R-20 in order to meet the unique requirements of commercial and residential new construction and renovation. Designations include a two-digit number that represents the amount of light transmitted through the coated film. For example, Heat Mirror™ 22 is designed to block more infrared light than Heat Mirror™ 88. The polyester film bisects a layer of argon or krypton gas that fills the gap between two glass panes, creating an extra airspace that significantly improves the window’s R-value and associated heating and cooling costs. Inspectors and building owners may become confused regarding the properties of Heat Mirror™ and other green products commonly applied to windows, such as low-E coatings, which also use a reflective layer to reflect infrared energy. A low-e film, however, is made from metal or metal oxide instead of polyester and is physically applied to the glass surface. Unlike Heat Mirror™, a low-E coating does not increase the number of air spaces in an IGU. A debate has persisted for many years concerning which is the better design, with proponents on each side pointing out defects and inefficiencies of the other product. The two designs are sometimes incorporated in the same IGU for additional protection against heat or infrared energy loss. Amory Lovins is a Colorado resident who pays $0 in energy bills for what may be one of the greenest houses on the planet, according to MSN Money. Heat Mirror™ and other energy-saving features have allowed Lovins to harvest 28 banana crops in his indoor banana jungle without the aid of central heating, despite the fact that his Rocky Mountain estate experiences sub-zero blizzards every winter. There are also plans to install Heat Mirror™ in the Empire State Building’s 6,500 windows as part of the building’s energy retrofit project. According to BusinessWire, the installation of Heat Mirror™ in the windows of New York’s tallest building will decrease energy costs by $400,000, cut solar heat gain in half, and improve the windows’ R-values from R-2 to R-8. Skyscrapers and alpine banana jungles aside, most Heat Mirror™ window film is found in ordinary residential and commercial structures, although it is among the more expensive options available. CCPIA inspectors may be on the lookout for older types of Heat Mirror™ that are prone to discoloration, warping, becoming brittle, and seal failure. One such defect is yellowing, caused by impurities that make their way onto the film before it is sealed within the glass panes. Wrinkling is also a problem in older Heat Mirror™, as you can see in the accompanying photo. These problems have largely been resolved in recent years, as Southwall has corrected manufacturing errors and more closely scrutinized their licensed distributors. In summary, Heat Mirror™ and other types of window films are designed to reflect solar heat, increase a window’s R-value, and/or provide shading while reducing the building’s energy costs for both heating and cooling, sometimes significantly, depending on the product. CCPIA inspectors who perform energy audits can help their clients with recommendations on the most appropriate choices for the application and budget.